The emergence of Bluetooth speakers has added another feather of convenience on the cap of modern music entertainment. These tech-savvy electronics have also raised the bar of sound clarity and quality for music lovers. The speakers are crafted with excellent features that enable you to enjoy the level of entertainment convenience that you deserve as a 21-century music fan. They save you the inconvenience of wires that are inherent in traditional speakers, allowing you to carry your music with you wherever you go. Additionally, they come at varying prices, and this flexibility makes them affordable across various market segments. This review seeks to open your eyes to the top 10 best Bluetooth speakers under 50 on the market in this year, so that you can make a smart buying decision based on accurate information. Which is the best Bluetooth Speaker under 50? The SoundCore Bluetooth Speaker is one of the best portable speakers under 50. The device features excellent sound quality available within this price range. It also allows you to enjoy great sound even at the highest volumes without distortions. Besides, the speaker has an exceptional battery life that permits you to continue enjoying your music for 24 hours, which makes it a leader among most if its peers within this market segment. To ensure that its benefits are not limited to a specific geographical spot, the speaker is designed with portability in mind. Moreover, the speaker has the latest Bluetooth 4.0 connectivity that allows you to quickly connect and pair it with other Bluetooth appliances. This superior technology also enables the speaker to reconnect automatically to the last device it was paired with. Lastly, it has a built-in microphone system that allows you to make hands-free calls. It does not come with a travel adapter. This speaker is has carved itself a name among the best Bluetooth speakers under $50 on the market today. The speaker is built with 10-Watt acoustic drivers, and it has a smaller size that makes it easy to carry and move with. Additionally, it has an excellent passive radiator that allows you to enjoy perfect bass that is free from distortions that arise from higher volumes. Its Bluetooth 4.0 technology enables it to connect to other devices easily without the need for pairing codes. Moreover, you can connect it to other devices that do not utilize Bluetooth technology using a 3.5mm port. The speaker also has a built-in rechargeable 2000mAh battery that gives you a 12-hour playback time. Lastly, you have no reason to worry about spillage or scratches because it is insulated with a tough rubber material. This speaker has a solid place among the most popular wireless speakers under $50 ruling the market today. The device is crafted with Bluetooth 4.0 connectivity that enables you to connect to other Bluetooth-enabled appliances without the hassles of pairing codes. Moreover, you can still connect it to other electronics that don’t use the Bluetooth technology via a port. The battery life of the speaker is stable, and it allows you to enjoy your music for up to 15 hours. Additionally, it allows you to continue making calls due to its built-in hands-free microphone system. Moreover, the speaker is compatible with mobile devices across all platforms such as Android and iOS. With this speaker, you enjoy a better sound quality, and you can carry to with you wherever you go due to its portability. Moreover, you can still connect it to other electronics that don’t use the Bluetooth technology via a port. The battery life of the speaker is stable, and it allows you to enjoy your music for up to 15 hours. Additionally, it allows you to continue making calls due to its built-in hands-free microphone system. Moreover, the speaker is compatible with mobile devices across all platforms such as Android and iOS. With this speaker, you enjoy a better sound quality, and you can carry to with you wherever you go due to its portability. This speaker is one of the best Bluetooth speakers under 50 dollars. The little but effective appliance allows you to stream your favorite music wirelessly using Bluetooth connectivity. It is also integrated with a powerful microphone system that allows you to continue taking your calls using its hands-free capabilities. Additionally, you can charge the device using an integrated power bank. The appliance also comes with a stable 1200mAh battery that lasts for 10 hours. Moreover, you can control the tracks and volume of your music from the speaker itself. The speaker also boasts of better sound that is free from distortions due to its built-in noise-cancelation microphone. Lastly, it allows you to share not just music, but also movies and games. The list of the favorite wireless speakers under $50 is not complete without this speaker. The device boasts of a Bluetooth 4.0 connectivity that allows you to connect it to devices that cut across various device platforms such as Android phones, iPads, iPhones, tablets, and Macbooks. The battery life of the speaker allows you to enjoy your music for more than 8 hours after the last recharge. Beyond just enjoying better performance, you also enjoy peace of mind due to the 12-month warranty that gives you a fall-back to resort to. The battery life of the speaker allows you to enjoy your music for more than 8 hours after the last recharge. Beyond just enjoying better performance, you also enjoy peace of mind due to the 12-month warranty that gives you a fall-back to resort to. This speaker is among the favorite Bluetooth speakers under $50. It allows you to enjoy high-quality sound and streaming from various smart devices such as tablets and smartphones. The device also allows you to enjoy clear calls due to its speakerphone that reduces echoes and noise. The device is also water and splash-proof hence it saves you the worries that arise from the prospects of splashing and rain. Moreover, you can still enjoy your entertainment anywhere you go since the speaker was designed with portability in mind. It produces loud and clear sound. It boast of an excellent Bluetooth sync. It has a shorter battery life of 5 hours compared other speakers within this price range. This speaker is one of best wireless speakers under 50. The speaker allows you to enjoy an excellent Bluetooth 4.0 connectivity that permits you to enjoy your music within a long connection range of 33 feet. Moreover, this Bluetooth technology enables you to connect the appliance faster within a mere 3 seconds. The device also charges faster, within 3 hours, and lasts for another 12 hours. Additionally, you experience better sound quality due to its passive subwoofer and a 3-Watt audio driver. The device is also a perfect choice for outdoor use since it is resistant to dust, splash, and shock. Moreover, this Bluetooth technology enables you to connect the appliance faster within a mere 3 seconds. The device also charges faster, within 3 hours, and lasts for another 12 hours. Additionally, you experience better sound quality due to its passive subwoofer and a 3-Watt audio driver. The device is also a perfect choice for outdoor use since it is resistant to dust, splash, and shock. Sound quality isn’t the greatest. The speaker boasts of a firm place among the best wireless speaker under $50. The speaker is built with high quality drivers that make it a perfect choice for indoor and outdoor use. Additionally, the speaker is designed with a 1000mAh rechargeable battery that gives you a 10-hour playback time. Moreover, you can connect the speaker to other devices regardless of whether they are Bluetooth-enabled or not. Regarding connectivity range, the speaker has a 33-foot scope that allows you to carry on with your entertainment. Its design is also stylish and it offers you a great taste of elegance and fashion. In addition, the device has stable performance that enables it to work compatibly with different appliances such as Android, iPhone, iPad, iPad, and other MP3, and 4 players. Additionally, the speaker is designed with a 1000mAh rechargeable battery that gives you a 10-hour playback time. Moreover, you can connect the speaker to other devices regardless of whether they are Bluetooth-enabled or not. Regarding connectivity range, the speaker has a 33-foot scope that allows you to carry on with your entertainment. Its design is also stylish and it offers you a great taste of elegance and fashion. In addition, the device has stable performance that enables it to work compatibly with different appliances such as Android, iPhone, iPad, iPad, and other MP3, and 4 players. It’s design is also stylish and it offers you a great taste of elegance and fashion. In addition, the device has stable performance that enables it to work compatibly with different appliances such as Android, iPhone, iPad, iPad, and other MP3, and 4 players. It is compatible with various devices across different platforms. Perfect quality sound at between 70 and 80% volume. It has a great build. You enjoy a wider connectivity range. Its bass is not the best. The AmazonBasics Portable Bluetooth Speaker is one of the best portable speakers under 50. The speaker allows you to continue enjoying your music within a wider range of 33 feet away from your Bluetooth-enabled device. Moreover, it works well with smart devices such as tablets and smartphones. Additionally, it allows you to take your calls due to an integrated microphone that gives you a hands-free functionality. You can also be sure of enjoying a longer playback time of up to 15 hours due to the better battery life it has. Moreover, it works well with smart devices such as tablets and smartphones. Additionally, it allows you to take your calls due to an integrated microphone that gives you a hands-free functionality. You can also be sure of enjoying a longer playback time of up to 15 hours due to the better battery life it has. You enjoy a broader connectivity range. The speaker has better battery life. The sound quality and charging system are not the best. It also has an automatic reconnection to the last device it was connected to. Its Li-lon 2200mAh battery takes 3 hours to charge, giving you a minimum 12-hour playback time. The speaker also offers you superior sound quality and bass. The speaker has a broader connectivity range. The device has a better battery life. It has a superior sound quality. The SoundCore Bluetooth Speaker is one of the best portable speakers under 50. It has excellent sound, and it allows you to enjoy distortion-free sound even at the highest volumes. Moreover, it has a longer battery life of up to 24 hours. Additionally, it has the latest Bluetooth 4.0 technology that enables you to connect and pair it with other Bluetooth appliances faster and easily. This connectivity technology also allows the speaker to reconnect automatically to the last device it was paired with. Its integrated microphone system enables you to make hands-free calls. These excellent features catapult this speaker ahead of the park among Bluetooth speakers retailing below the $50 price tag. If you are looking for better wireless entertainment within this price range, you may have every reason to consider this speaker. 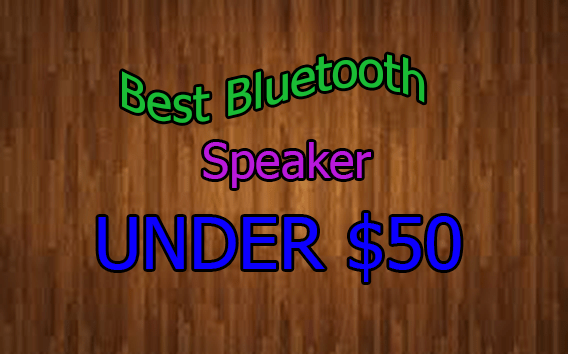 Your search for the Top 10 Best Bluetooth Speakers under 50 will lead you to many options. The availability of various competing brands on the market may leave you lost for choice. That is why this article seeks to give you a complete coverage of the top 10 brands that are suitable for your needs. These speakers come with different connectivity ranges, and they also offer you the freedom to carry your music wherever you go. This article offers you the best yardstick that will enable you to make the most suitable choice out of the many wireless speakers we have covered above. A great set of speakers is a typical need for about everyone. To choose the best speaker at a low cost is very difficult. Thanks for your suggestion. I also maintain a site, hope this will help you.